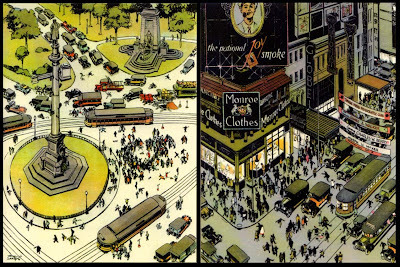 This book was reissued last year in a facsimile edition and could serve as a master-class in the art of portraying the modern city. Sarg’s artfully chosen city landmarks are populated by turbulent teeming crowds that surge to and fro in frenzied motion. A happy combination of a gestural drawing style and a precise spatial framework conveys to perfection the energy and dynamism of the world’s first great metropolis. 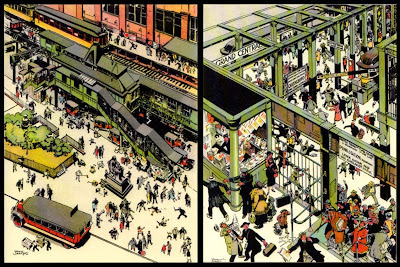 These images bring the city to life in the same way that the covers of The New Yorker (launched 2 years earlier in 1925) so often do. Not only was Tony Sarg a wonderful illustrator, he was also a master puppeteer that introduced the helium-filled balloon characters to the Macy's Thanksgiving Day Parade.